HairStyle Solutions: Just How Safe Are Hair Vitamins? The New Jersey company Rise-N-Shine is offering CNN's Anderson Cooper $1 million dollars to take its "Go Away Gray" hair vitamin. Nothwithstanding that gray hair is the Silver Fox's signature look, questions abound as to whether the pills are actually safe. 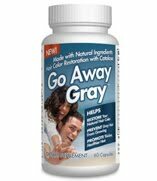 "Go AWAY Gray is specially formulated to prevent and reverse unwanted gray hair. Based on recent scientific studies, low levels of the enzyme Catalase in your body can turn your hair gray. Hydrogen peroxide is naturally produced by the body and Catalase breaks it down. If you are not producing enough Catalase, the hydrogen peroxide cannot be broken down. This causes the hydrogen peroxide to bleach the hair from the inside out, making it gray. Go AWAY Gray contains the enzyme Catalase, along with other special nutrients to reverse and prevent gray hair and to also promote thicker, healthier hair! Take Go Away Gray today and watch your gray go AWAY!" In addition, the product contains "a proprietary mixture of natural ingredients including vitamin B-6, folic acid, saw palmetto and l-tyrosine." The scientific speak may sound plausible, but Consumer Reports doesn't like how easily the product came to market. In its September 2010 issue (cover story "The 12 Most Dangerous Supplements"), Consumer Reports highlights the fact that no real scientific backup is required to to bring a vitamin or mineral supplement to market. Cathy Beggan, president of Rise-N-Shine, is quoted as saying that her company has not had to provide product information on "Go Away Gray" to the Food and Drug Administration. Furthermore, the company did not conduct any clinical trials of the supplement before putting it on the market but is now looking into it "to have some concrete data behind (the product)." CBS news in San Francisco interviewed nutritional biochemist Jay Foster about the supplement. He concluded that too much l-tyrosine can be a problem for people who take medication for high blood pressure and thyroid disease. He also said that a mineral deficiency (like copper) may be the reason why a body is not making enough catalase.